Our annual Footballers v Burhill members Matchplay event took place on Friday the 8th September and after 3 consecutive wins by the members, we managed to secure a 4-4 half. The event was looked after this year by Kenny Hibbitt and Russell Osman in my absence and together the selected the pairs they chose got a creditable half. Well done to All those who took part who included , Kenny Hibbitt, Russell Osman, Sir Trevor Brooking, Les Strong, Paul Jewell, Maik Taylor,Brian Stein, Paul Walsh, Mark Falco, Perry Digweed, Teddy Maybank, Paul Jones, Steve Lomas, Ian Evans, John Fraser, Tom Doherty. Thanks guys, I can now walk down the high street and when I bump into the Burhill members, I won't have to duck in a door way to avoid the abuse. 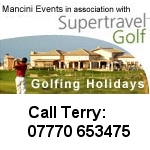 If you and some members of your club fancy taking on me and some of my Ex-pro footballing friends, please let me know...we'll make it a great day - terry@mancinievents.co.uk 07770 653475. Dates and prices to be discussed and agreed.